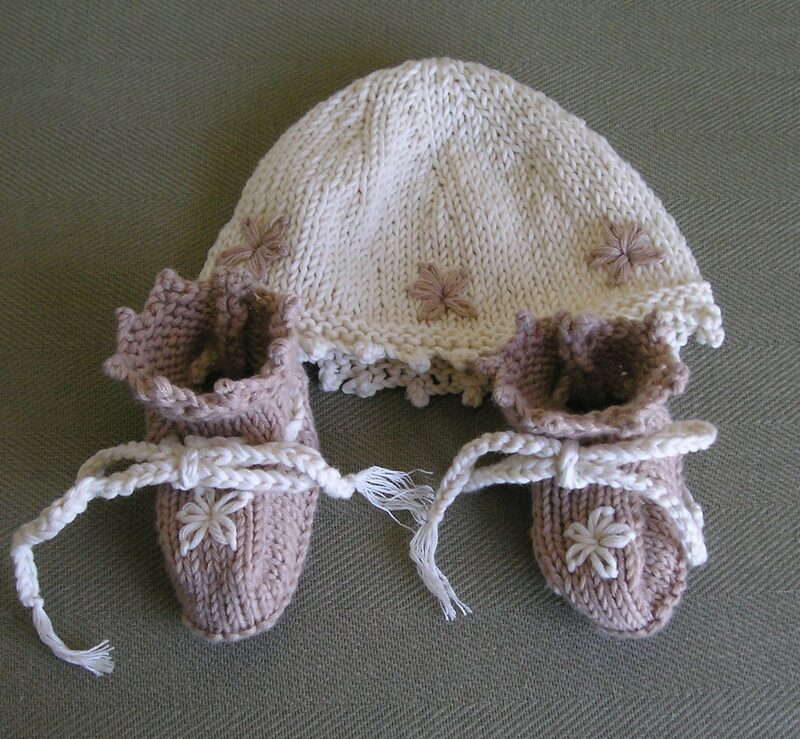 Hat and Booties for Baby Lewis Finished! In my excitement to finish the hat and booties for Baby McKerrow (see here for the beginning of that journey), I had set aside my goal of making a hat and a pair of booties for my goddaughter’s baby girl. [Note to self: Does that make me a grand-godmother?] This little one wasn’t due until early May, whereas Baby McKerrow is due in about a week, so I prioritized. Although the mission statement of the book, as expressed in the subtitle “Beautiful Designs Using Organic Yarns,” seems a perfect fit for my nature-loving goddaughter, I must admit that I used the available yarn in my stash instead. If you like neutrals and natural fibers (especially cotton) for babies and moms pre- and post-partum, this is the perfect book for you. The patterns call for basic to intermediate level skills–nothing too arduous–and are very classic. Anything you make from this book will stand the test of time. I did make some minor modifications to the original pattern for the booties, however. The pattern called for several lazy daisy stitches but I opted for just one, and the pattern called for a ribbon tie but I crocheted a couple of ties. The biggest change I made was on the cuff of the booties; Harding’s pattern calls for a ribbed cuff, but I thought that a picot-edge cuff matching the picot-edge of the hat would be cuter and would tie the hat and the booties together better. If you want to do a picot-edge cuff like I’ve done, it’s very easy to modify Harding’s pattern. 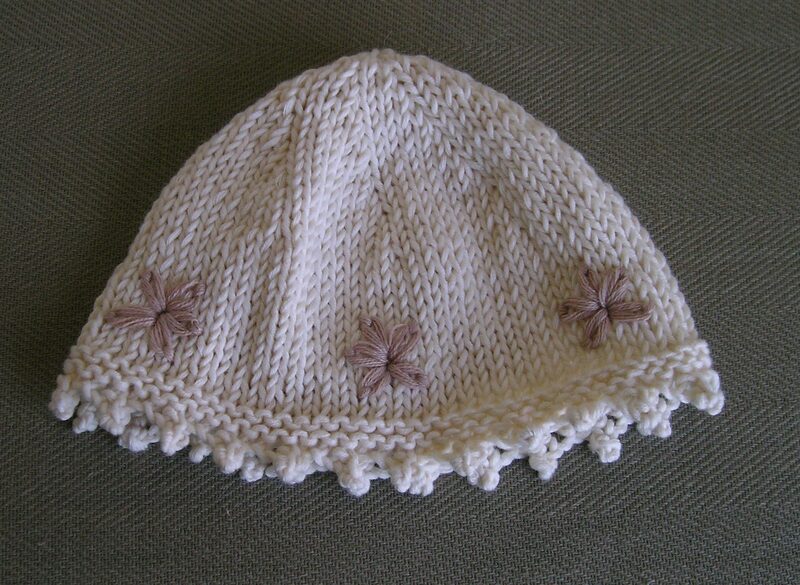 Just work a picot cast-on as you did for the hat until you have 27 stitches total (9 X 3). Then work four rows in garter stitch (just as you did for the hat pattern) and proceed from row 4 as called for in Harding’s pattern. This is the first pair of booties I’ve ever worked from the cuff down, and I must admit I found working the instep a little uncomfortable, but the results are hard to argue with! I also love how the neutral colors take away from the potentially cloying girliness of this pattern.